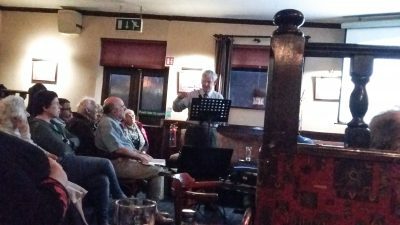 The April talk for Skerries Historical Society was a truly special event with two speakers, David Grundy and Maurice Harmon, presenting ‘Ardgillan Halt’ to a big crowd in Keane’s The Bus Bar. David Grundy, one of the Ardgillan guides and a noted local historian, introduced the subject showing John Claudius Loudan’s beautiful architectural illustrations of ‘A Castellated Lodge as a Dwelling for a Gardener or Other Upper Servant on a Gentleman’s Estate’. This was the design used to build the North Gate Lodge at Ardgillan in the 1830s and the upper servant who lived in it was the gatekeeper. 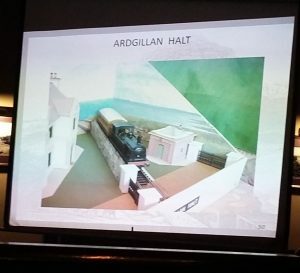 A decade later the gatekeeper found himself with a new role as the attendant at the Ardgillan Halt after the Dublin to Drogheda Railway negotiated with the Reverend Edward Taylor of Ardgillan Castle to allow the line to cross Ardgillan lands on its way to Balbriggan. Concessions were granted to the Taylors such that any member of the family could have a passing steam train stopped at the Ardgillan Halt and avail of free travel to any station on the line between Dublin and Drogheda. built waiting room by the line where he would have a fire ready lit so the captain could be comfortable while he waited for the train. Mr Harmon would wait by the line waving his red flag until the train had stopped, he would then place a set of steps up against a first class carriage and help The Captain, by now an elderly man, up into the carriage. Once he was safely aboard, a green flag would signal the train driver that the train might continue on its way. At night he had a lantern with different coloured filters to use instead of flags. Other members of the family also travelled on the train and, on at least one occasion, family and servants all climbed aboard as far as Malahide where a great Christmas party was being held. Maurice’s mother once made use of the railway in a slightly less conventional manner. She had gone shopping in Clery’s and bought a roll of beautiful new linoleum to redecorate one of the rooms in the lodge. She could not demand that the train be stopped for her, even though her husband was the attendant at the halt. Instead she waited until the train was passing through Ardgillan woods, opened the carriage window and hurled the lino forth with all her might. Then she continued to Balbriggan station, walked back home along the road and dispatched Maurice and his father into the woods to find the precious roll. A very resourceful lady! Sadly the lodge was demolished in the 1980s and the waiting hut in the 1990s.